F-A-Natic Fridays – Congrats to Ray Allen!! 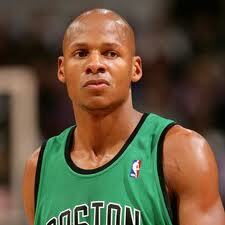 Thursday night (2/10/2011) Ray Allen aka Jesus Shuttlesworth became the All-Time NBA Leader in 3 pointers made (2,560). He passed NBA great Reggie Miller in the 1st quarter against the LA Lakers; it’s a great accomplishment for a future Hall Of Famer. Being a fan and Alum of Syracuse I know all too well the exploits of the great UConn player Ray Ray… as it seems like he has been hitting 3 pointers forever. As a fan of the Cuse and the New York Knicks (2 teams Ray has killed over the years) I say Congratulations to Ray Allen!! NY Knicks “Blue & Orange”, of course it had to happen!! Ray played @ Syracuse University?